2011 was an eventful year. Revolution (Tunisia, Egypt, Libya), crises (Eurozone, phone hacking), disaster (East African famine, Japanese earthquake), unrest (England, Syria) and deaths (Kim Jong-il, Osama Bin Laden.... and Amy Winehouse) made it seem less like a normal year and more like an end or season finale for all of mankind. It will certainly go down in the history books as one heck of a year. One of the biggest stories to try and grab a slice of the headlines was the continuing financial crisis in Europe. Credit rating have been downgraded, governments have fallen (poor old Silvio) and bailouts have been chucked around like hot pies burning Hessian hands. Despite the bailouts the performances of some European economies are still more disappointing than biting into a pie only to find it has no filling (see the air pies review). If things weren't gloomy enough, European leaders are already warning that 2012 is going to be a tough year for the economy. It is interesting to note that while the UK economy has been struggling, sales of pies have actually increased over these islands. It is well known that pies have a good calorie to pound ratio which is so often cited as a bad thing. However as recession bites maybe the reverse is true as people try to save the pennies. Another possible reason is that pies are one of nature's ultimate comfort foods. There is nothing quite like a pie pick-me-up and the warm glowing feeling it brings. This leaves us in the position where the pie industry is one of the few growth manufacturing industries in the country. Could pies spearhead our return to economic prosperity? Pierate is however not just confined to the UK so we want to spread the word about the economic benefits of pies to other countries who find themselves in difficulties. The country at the centre of the financial storm seems to be Greece. The strikes of 2012 have already started and despite the crippling austerity measures there remains the real possibility of a default on their debts. Hence, this Pierateer decided to stand in solidarity by making a Greek themed pie. 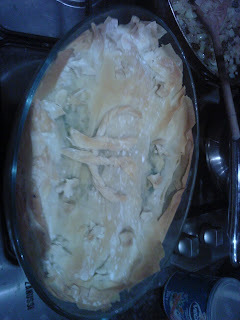 Fortunately Greek culinary tastes can be easily transposed to the pie arena if Filo Pastry is used. 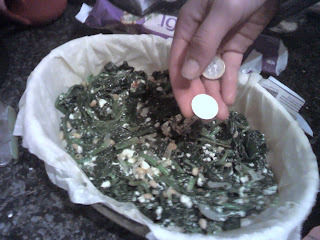 Hence a Greek Solidarity Feta Pie (as seen previously in Filo-ing Good) was created. This followed a similar recipe as before (with a bit of Dill being added). However there was a twist, with the addition of 2 Euro coins in a similar way to putting sixpence in a Christmas pudding (believed to bring wealth for the coming year). The idea was that whoever got a coin in their slice of pie had to sing (or at least vaguely hum!) along to the Greek national anthem. Fortunately this pierateer was not the one doing the singing and instead a German friend had the honour which seemed appropriate. Here is to a new era of pros-pie-rity. Have a great 2012 everyone!